I just love the colors and fresh feel! Thank you! Incredible bundle Marisa! Thank you so much!!! Thanks! These cards are perfect! This is perfect for a scrap journaling idea I have, and so very pretty. Thank you so much! I agree--WoW! So much work and so much inspiration! Thank you. This is such a lovely kit, Marisa, and so versatile. Thank you so much. Thank you that these are always available. I got hit with a very nasty virus a few days ago and ended up doing a factory image restore on my pc! This is such a phenomenal kit! How many uses we will be able to come up with. Thank you! Wow - is right!!! Thanks so much - can't wait DL and play!!! It's really GRAND! There are so many useful things! Thanks! Great bundle! Can't wait to use it ~ thanks! mojo returned, it came flooding in...LOL! I love the mix of black with with the pastels! Great for male or female pages! Thanks! LOVE this! Thank you Marisa! Perfect color palate to be used for so many pages! Just a beautiful kit! So much in here, I can't begin to imagine the time and work this took to create- just epic! Thank you Marisa. This is awesome. I can think of several layouts I want to use this kit on. Thank you Marisa! OMG Marisa! It will take hours just to go through this bundle. Can't imagine how much time you put into it. I haven't unzipped yet but am intrigued by all the piece and parts. I especially like the BW contrast against the muted tones. Thank you. Absolutely love the black and white mixed with pops of colour! This bundle has got everything! Can't wait to get stuck in! When you take photos, what you are actually doing is recording the "here and now" of those moments in your life. 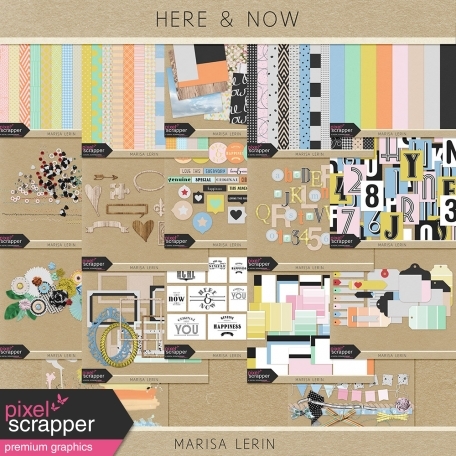 In this bundle, appropriately titled "Here & Now", Marisa has left no stone unturned to help you scrap all those special moments. She has been known to design some megakits, and this is one of them! She started out with an incredible 52 papers, 6 alphas and 5 alpha-journal card sets, then added frames, labels, fasteners, flowers, paint, ribbons, stitching, word art and more for this amazing 18-kit bundle! Yes, you may repeat with us: WOW! 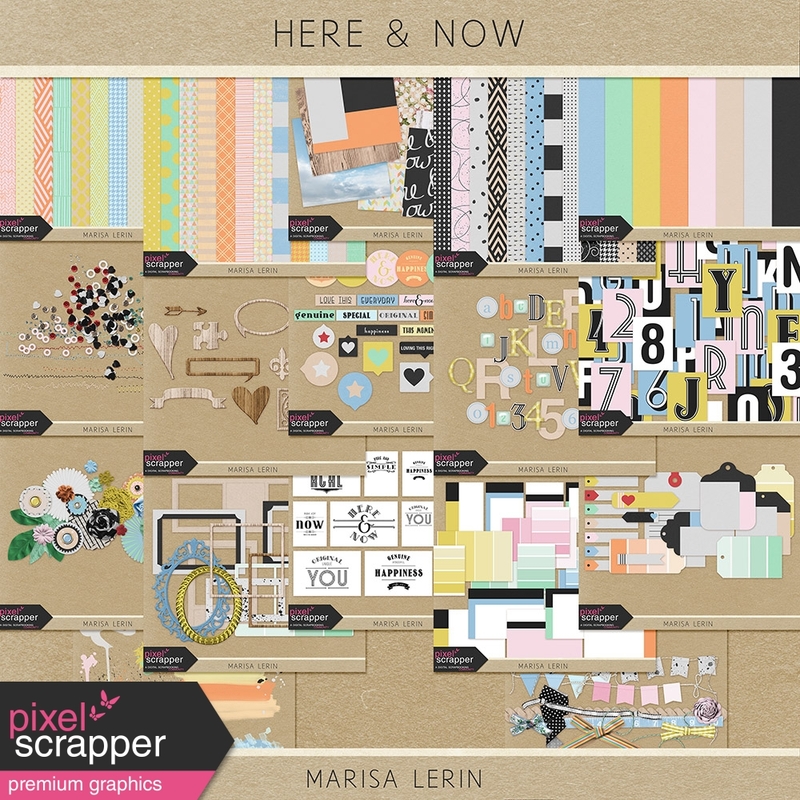 We can't wait to see what you're inspired to create with Here & Now!